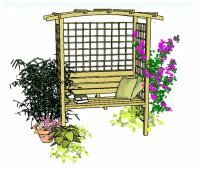 Can I Use the Hexagonal Pergola Plans With A Swing Bench? My goal is to hang a garden swing bench from 4 of the 6 sides of the hexagonal pergola I am going to build, leaving one for a trellis panel and the other for ingress/egress. I'm hoping to have a fire pit in the center. If I assume swings with a load rating of 300lb each, will your hexagonal plan be sturdy enough for the weight? The ideas for your pergola sound great! It is important to note that the plans are written to be used with any size of posts and rafters. Your pergola would have to be a fairly sturdy one, though. There are three things in particular you will need do to make sure everything is stable. The posts are anchored very firmly. The posts are not too far apart. The wood you use is of sufficient dimensions to bear the weight. Let's take the example pergola in the plans, which is 3m (or approx. 10ft) diameter. 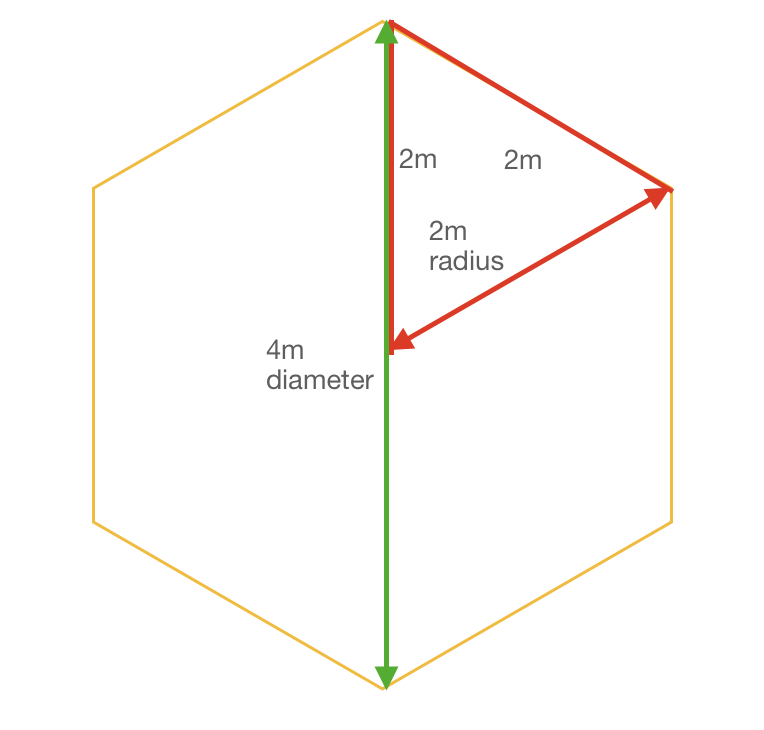 Because a hexagon is made up of 6 triangles, all with equal sides, the length of the radius (that's the distance from the centre, or half the distance across) will be approx 1.5m (5ft) which means the length between posts will also be approx. 1.5m (5ft). This is ideal for the distance between posts for your swings, but will depend on their size. Hanging benches can range in size from around 1.100m (3.6ft), which would fit in to the space with 20cm between each side of the seat and the post (just about do-able) to about 1.350m (53 inches), leaving 7.5cm on each side (not enough clearance). 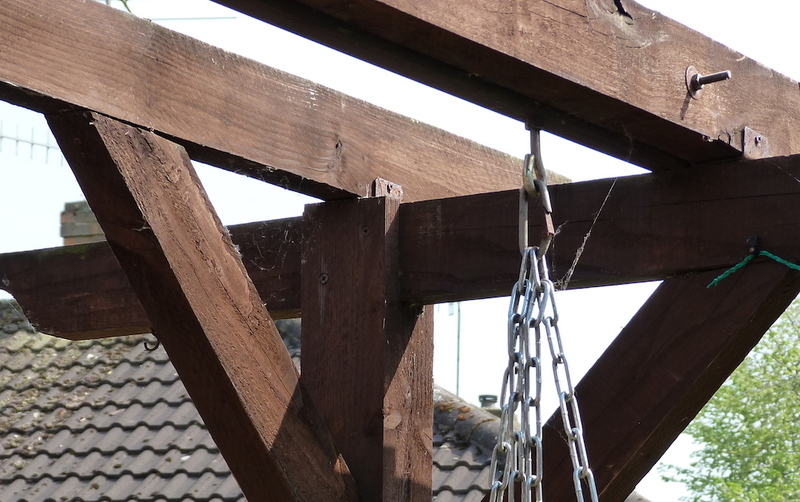 Usually this type of pergola swing is just for slight rocking rather than a full blown swing, but it's important to make sure there is a bit of room for manoeuvre! We don't want to be banging into the swing to the side, either. It's a good idea to choose the swing bench first. A 4m diameter pergola may be more suitable, but draw it out on the ground, even if it is only roughly with chalk or string to make sure the size will accommodate your swing bench. You can do this now, in the planning stages. Your posts will need to be minimum 4" for a smaller pergola or 6" for a larger one. Of course, the larger your pergola, the greater distance between posts, giving more room for swinging. Because the thickness of wood is greater, it is slightly more difficult to handle, but is needed for this type of pergola, and it will be there to stay. The support rafters, where the swings are attached, will need to be 3", 4" or 2 x 2" (joined together for ease of handling) thickness to avoid bowing and to give the strength needed. However, the rafters themselves can be 2", as they sit on top of the posts, and are only decorative in nature. It's worth noting that many manufactured pergola kits and arbours with swings attach them to a 2" thick support, and they are perfectly fine, but I do tend to err on the side of caution, especially where there is more than one swing. 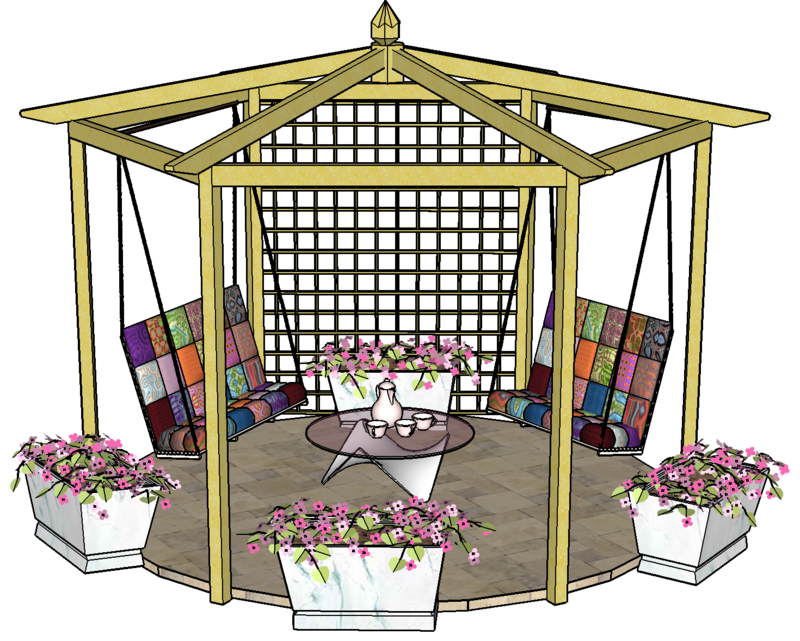 I have adapted a drawing for you of a large hexagonal pergola I did for someone else, to show the pergola with swings attached. Originally it measured 5m (16.4ft) in diameter, with 6" posts and 4" supports, with post to post at 2.5m, just over 8ft. For a 4m pergola the radius would be 2m so post to post would be the equivalent of 6.5ft - ideal. In order to ensure adequate strength, I tend to recommend including a central post as a feature of the larger hexagonal pergola. This isn't possible with a fire pit, however, unless it is off-set. Another option would be to 'pitch' the roof rafters. 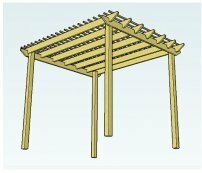 The pitched roof hexagonal pergola plans are part of the additional plans series, which include the step-by-step instructions for the flat rafter style pergola, too. These you have already. The pitch, or angle, of the rafters, coupled with the kingpin in the centre, make this, generally, a very strong structure, but as far as the rafters go when used with swings, it doesn't really make a huge difference, as the swings hang from the support rafters and not the angled decorative rafters. Here, we can see it below. I hope these ideas will give you some sense of what your pergola might look like. 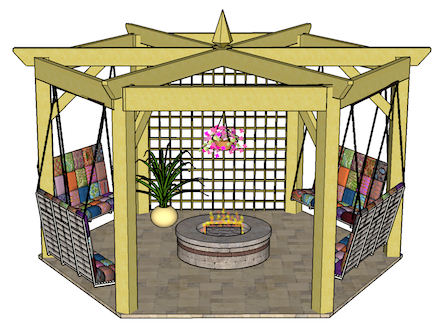 Even though Brian asked about an hexagonal pergola with swings, the same principles apply for any pergola design. 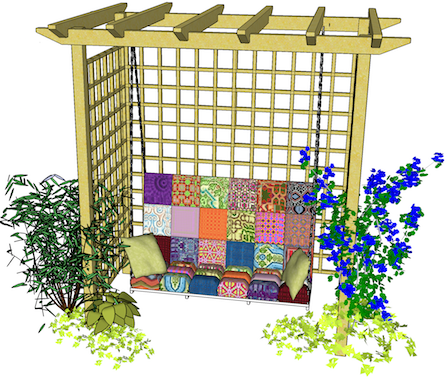 This is very easy to do with the free pergola plans. 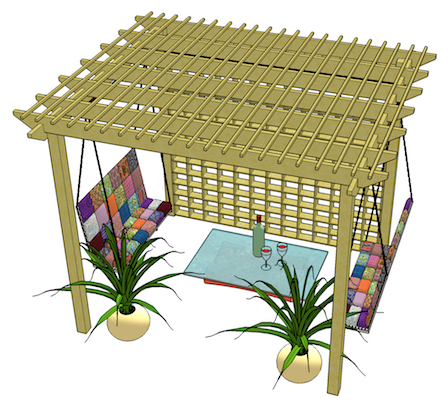 Here's what your pergola might look like made from the free pergola plans. This one has rafters and purlins across the top, with a trellis panel along the back. Lovely, isn't it, especially with a few well-chosen accessories? Here's a swing bench hanging from Geoff's lean-to attached pergola. Just the job for relaxing on a lovely sunny day. He used 2 x 2" thick rafters joined together, where the seat is hanging. The bolt for the swing bench runs through both rafters. We can see the double thickness below. Being a builder, Geoff always makes sure that the wood is thick enough for purpose, and the distance between posts is not too great. 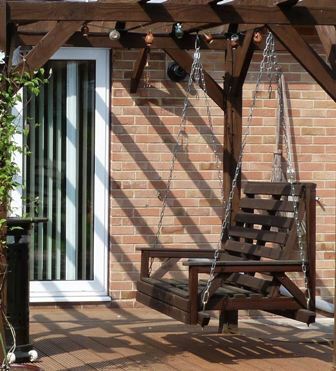 The swing bench can be set at an angle, too, as it is here hanging from this attached pergola. Very cosy and inviting. 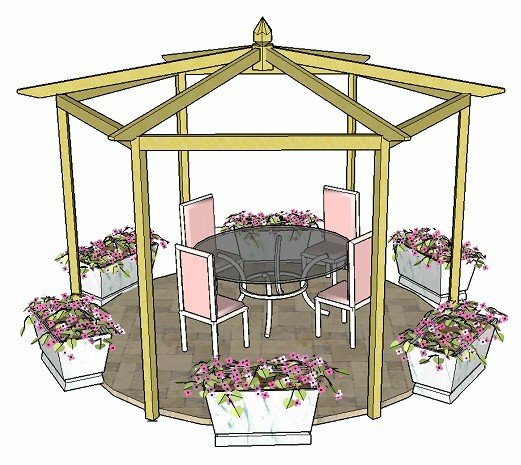 A seated arbour is wonderful for this type of swing, and is easily achievable using either the free plans or the arbour, pergola and arch plans. What a turnaround this year! Enthusiastic DIY pergola builders have been asking me about these swing seats for a while now. They really do make a statement in a garden. Previously, it has been tricky to source them, but thankfully there are quite a few more coming onto the market at the moment, and in different materials, too, so there is much more choice. Having so much more choice has made it easier to create exactly the pergola we want. However, because garden furniture is seasonal, we will have to wait for some swing benches to become available again this year. The Polywood benches usually retail around £150. 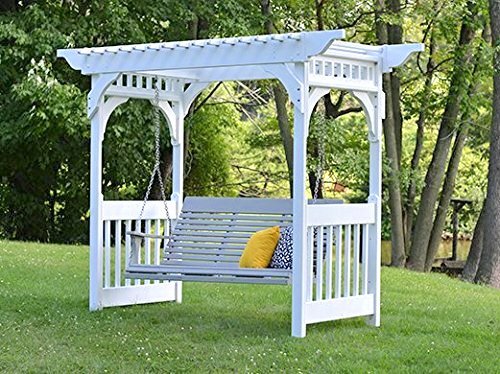 This is an attractive wooden swing bench with chains and fixings that can be used in many situations: hanging off pergolas, arches, porches and arbours. This metal pergola bench has been very popular since showing it on the pergolaplans4free blog. Metal can be made into very intricate designs that look fantastic in a variety of situations. This is another new metal swing bench available this year. Again, it is very intricate, giving a wonderfully classically romantic feel. For those of us who find room is at a premium, or if we'd like to hang a swing off a smaller pergola, this is an interesting seat. Here's a really colourful swing bench for under a porch or covered pergola. What a good idea. This recycled Polywood plastic lumber is ideal for a wooden look without the maintenance. The black one has £160 off at the moment. A slightly different design is available for these plastic wooden swing benches available in white and black from Eco-Friendly Furnishings. 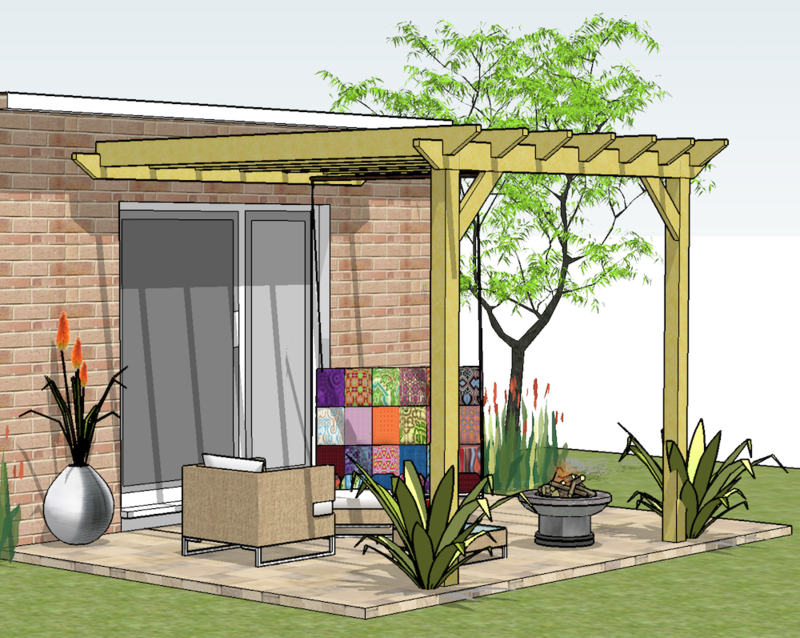 I hope I have been able to inspire you to have a go at making a fantastic garden pergola with an integrated swing bench. They look so beautiful, and everyone wants to sit on them! Here's one of the maintenance free, eco-friendly benches under a pergola arch. Imagine yours surrounded by colourful plants and climbers.